One of kirtan's brightest lights, yoga teacher and musician Luna Ray, recently visited the Himalayan Institute for Karina Ayn Mirsky's “Five-Day Summer Sangha Retreat: An Immersion.” During her stay, I had the pleasure of attending a gentle restorative class where I and other students were serenaded by Luna's soulful voice. Her creative rendition of the Beatles’ classic, “Let It Be,” still resonates in my mind. Before she returned to her home in Asheville, NC, we shared a cup of chai and discussed a range of topics, from motherhood and humanitarian work to the creative process and the path of bhakti yoga—as well as her new album, “Shining Through.” As I write this short introduction, I am listening to one of her newest tracks, “Lokaha.” With its uplifting and joyful sounds infused with ancient mantras, the melodies leave me with a sense of inspiration. The song reflects how dynamic and beautifully human Luna’s music is, and concludes with a harmony between Luna and her young daughter—truly enough to open anyone’s heart. What is bhakti yoga and what does it mean to you? Bhakti yoga is a path of yoga which guides us into our hearts and towards a meaningful life filled with intention and devotion. Through the practices of bhakti yoga—including kirtan, chanting, rituals, and mala japa—which all incorporate the use of mantra, we become more refined in our ability to be authentic and creative, in recognition that all moments in life are sacred and part of the divine tapestry. As a mother, a householder, a wife, and someone who works in the world, bhakti is very accessible for me. I can practice while I’m cooking, while I’m cleaning, while I'm driving, even while playing with my daughter. I chant the mantra through song, remembering and feeling the divinity of the name, and it connects me directly to something bigger…to the heart. As a mother, a householder, a wife, and someone who works in the world, bhakti is very accessible for me. What is kirtan and what is the impact it has on serving others? Kirtan means singing the holy names of God. The mantras by nature have the power, sound, and vibration to evoke emotion and move energy inside us. In our modern-day culture, unless we’re part of a church, we have lost places and times where we raise our voices and sing together, and singing is a birthright. People start to feel good, and within an hour or two, hearts are activated and there’s a deep sense of joy, connection, and hope in the room. Every time we have that experience, it’s an impression we can fall back on when we need to find that again. 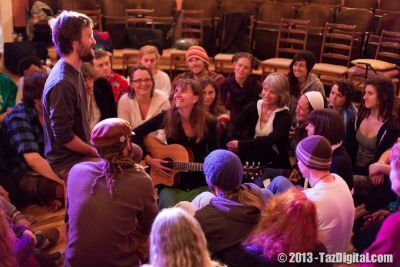 Sangha (community) is what’s at the core of yoga, and kirtan provides that for people. I love music. It’s one of the universal languages and it’s been something, especially when there’s intention behind it, which has opened my heart and connected me to something deeper and bigger in others as well. When I started playing guitar, I realized there was more for me—my soul just knew. I developed a drive to want to feel the vibrations of sound, and from there I started moving into spiritual environments where I would hear sacred songs. Slowly these songs started to weave themselves into what I would sing, what I would play, and where my creativity would come from. That was 18 years ago, and it just continues to evolve. As I continue to learn more about yoga, the techniques expand and open my mind even more. In this sense, bhakti kind of found me. What does your practice involve? It’s not too rigid. I don’t have a lot of rules around how I do it. Whether I have five minutes or an hour, I sit down at my altar and chant to connect with presence. I give my smaller self over to sing the holy names and the mantras. I’ve been spending time with Amritanada Mayi Devi for the last 13 years, and she’s been a huge inspiration for me as a woman, a bhakti, a selfless servant, and a reflection of the truth of who I am and who we are. She transmits that through her darshan—her direct transmission. You’ve released 2 albums thus far and have a third one on the way. Could you tell us more about the new album and when it will be released? My new album, “Shining Through,” will be released in the early winter of 2014 and pre-released in the fall of this year. It’s a blend of English and mantra, and the English serves as a bridge for the mind into the essence of where the mantra takes us. Eventually, we go beyond the usual stories we tell, and then we travel beyond the mantra itself—outside of every story line. The album will entail world grooves blended with beautiful melodies, harmonies, and deep intention to create a journey through the music, into your deepest self. Kirtan artists David Newman (Durga Das), Todd Boston, and Genevieve Walker make an appearance on the album as well. What does the album name mean? In these last few years I became a mother, and stepping into a deeper understanding of the divine feminine within me has been challenging. I’ve had to go places within myself that are deeper and darker than ever before, but the mantras have been the lifeline. Whenever a strong emotion contracts me, the mantra is what I have always been able to hold onto, and it brings me back. Shining through is a remembrance that no matter what you’re going through in life, there’s something that will hold the light for you—so just hang on. The mantras can become your consistency. How did your previous albums influence “Shining Through”? The first album, called “Where Heaven Meets the Earth,” is mostly English, and it’s full of what were my prayers for so long. The second album is almost all mantra, with a little bit of English. This third album is a blend of the two coming together. What is the song-writing process like for you? It’s about a feeling, openness, and a prayer. I call it “catching songs” because that’s essentially what happens for me. Creating time and space to do the work gives the songs energy from the beginning. As I write, I get into the space and I may have a feeling of what the energy or theme of the song is going to be about, and you really have to be open. For me, the songs that come through are deeper teachings, to help me process what’s going on in my life, and hopefully other people’s too. I can feel when it’s the right melody, or the right chords, and when it’s not, then it just isn’t going to catch. 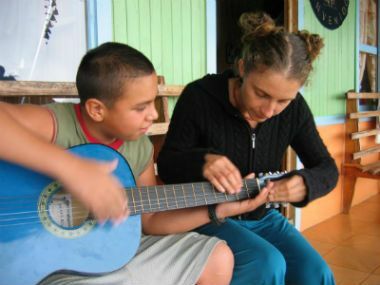 Could you tell us about the work you’re doing in Costa Rica? Over the last 10 years we have been bringing educational groups to Costa Rica where the intention always has been to ask travelers to use nature, and culture, to go deep within themselves and transform. One of the most important parts of those trips is a service component, and there are several villages and groups of people we have been working with. Every week we work with the local communities based on what their needs are. That’s the piece to me that has felt so meaningful because it’s the karma yoga, and it’s often the part of the week that people remember the most. You have stated that the Himalayan tradition has been a huge influence in your life. Could you explain? I’ve been studying with this lineage for eight years, and it really drew me to teaching yoga asana. 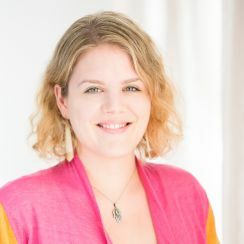 The philosophy supports my jnana yoga, and the techniques expand me as a human as well as deepen my practice of bhakti—which I consider less structured. Some yoga practices aren’t accessible for everyone, and yet everyone can sing to God. If I can open up a space that’s safe and from the heart, with intention, where we can sing to God together, then something happens for people, and that’s my goal. This lineage serves as my anchor, and I think this transmits through my kirtan. Some yoga practices aren’t accessible for everyone, and yet everyone can sing to God. You’ve had over 10 years of experience teaching yoga. In your opinion, what makes a teacher truly great? Honestly, the qualities I find most valuable are whether or not they’ve done the work themselves, the transmission they bring, and how much of a yogic intention they’ve brought to life. The amount of passion they bring matters as well. After all, when you do what you love, love is what you do. While I appreciate great techniques, when it’s clear that someone has traveled through the depths within themselves, and has sustained a commitment to grow through these experiences, and that they have a passion for inspiring and uplifting others, that’s what makes a great yoga teacher.